UK edition. Go to US edition. MANY WILL START. FEW WILL FINISH. Only the strongest will survive. 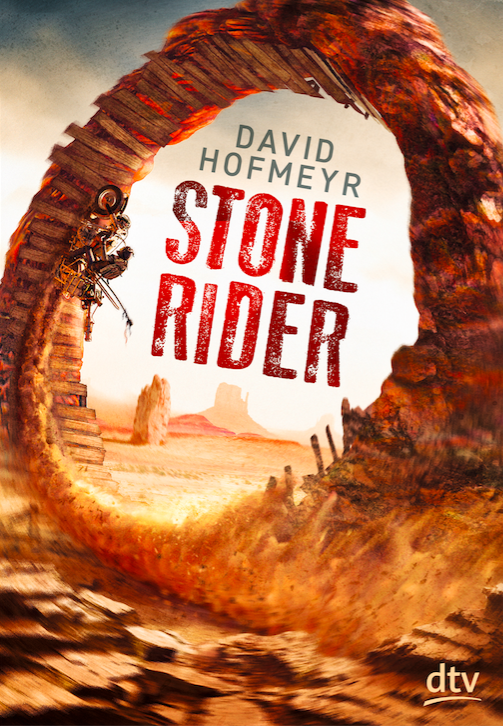 Stone Rider is a gritty coming-of-age story. A boy who has lost everything must join a brutal race to escape a dying Earth. Adam wants to escape the memory of what happened to his father, but there’s only one way. It means leaving his brother Frank behind and entering a gruelling desert race on semi-sentient bio-mechanical machines. A death race. The prize? A one-way ticket off-world. This is an epic sci-fi Battle Royale. The stakes are high, the highest possible – Adam could lose everything: the girl he hasn’t yet won, the life he hasn’t yet lived. While Adam knows it’s safer to ride alone his instinct for self-preservation is threatened by the friendships he forms, including his uneasy alliance with the mysterious Kane. Facing sulphur storms, sabotage and wolves, encountering violence and romance, he rides on through a brutal, lawless land searching for salvation. Unnerving and haunting, but ultimately hopeful, STONE RIDER is a story about revenge, survival and redemption. “Blackwater looks perfect from above. Peaceful. A silent crescent of buildings. Like a secret sign for the gods, stamped out in the desert sand. There is grandness in the neat perfection of the shape, a measure of what Blackwater might have been. But the effect of the concentric rings and straight roads is also disconcerting. A paradox of order and technology in a world governed by whim and terror.